We All Scream for Sorbet! This article was written by volunteer Jessica Zdeb. At Scream Sorbet, the raw ingredient always comes first. Whether it’s a fruit, nut, vegetable or herb, the process starts at the farmers’ market. “We buy it first and figure out how to make sorbet out of it later,” says Scream’s owner and founder Nate Kurz. Some ingredients are obvious choices for sorbet, others are the product of constant experimentation and fine-tuned attention to what’s in season. “Sometimes we just know something tastes good, so we figure there must be a way to make delicious sorbet out of it,” says Nate. This philosophy can mean Nate and his team test as many as ten different recipes per ingredient, but the effort has paid off. Letting the ingredients speak for themselves has led to some unexpected flavors like citrus fennel and almond saffron. Nate founded Scream in 2008 after tossing around ideas for farmers’ market-based businesses, a brand new field for this former software engineer who recently relocated from New Mexico. The idea was simple: buy the best produce from local farmers, turn it into sorbet, and sell it solely at farmers’ markets. With the help of chef Stephanie Lau, formerly of Café Fanny and Google, self-described “frozen dessert freak Noah Goldner (pictured below),” and eight other part-time production and sales helpers, the idea came to life. 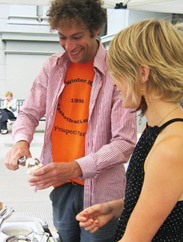 Today, six fresh flavors of Scream sorbet are scooped up every week at over 20 markets. Since fruit and vegetable flavors are based on market produce, they change constantly: nectarine, pluot and sweet corn sorbets are available now; pear, persimmon and grape will appear the fall; citrus, kabocha squash and beet in the winter. Raw produce comes in from farms like Hamada Farms, Brokaw Nursery, and Twin Girls Farm. Each ingredient is hand-processed, whether that means halving and juicing Murcot tangerines, peeling, chopping and juicing beets, or blanching and peeling almonds. Scream’s nut flavors are a particular source of pride. They consist simply of water, ground nuts, sugar and sea salt. “If people tell me they don’t like pistachio ice cream, I make sure they try the sorbet,” says Noah. 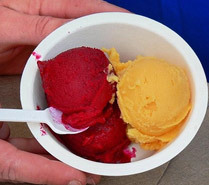 Scream sorbet is made with a high percentage of whole fruit — sometimes much as two-thirds, depending on how sweet it is. The level of sugar, or brix, of the fruit is vital to the process — and it’s kept constant for all the flavors. They add just enough sugar to make the sorbet scoopable, without making it too sweet. That means the fruit can’t be too sweet to begin with; they missed out on early-season tart blueberries this year, for example, so there was no blueberry sorbet. It’s not just the recipes that set Scream apart. They blend their sorbets (the night before each market) in 1-quart batches with a Pacojet, a high-end blender with blades that shave the frozen mix into razor-thin layers for a velvety final product. From a sustainability perspective, it also means less waste because it blends the skins of things like plums effortlessly. It also adds only three percent air to the volume, unlike other small-batch freezers that add 25 percent. Plans for pre-packed pints and an online ordering system for market pick-up are in the works. For now, though, Nate says they’ll continue pursuing the freshest market produce and experimenting with it. Partner Noah Goldner agrees. “We may have a product that changes how people think about sorbet,” he says. You can find Scream at the Thursday market and keep up with their weekly flavors on Twitter.